A Boy That Needs a Friend, Finds a World That Needs a Hero. Having been born in 1983, I was fortunate enough to experience the golden age of 80s fantasy cinema. I stared awestruck at George Lucas’ version of “The Hobbit” (i.e. WILLOW), I cowered in fear before the mighty Lord of Darkness played by Tim Curry in LEGEND, and reveled in the bizarre mix of swords, sorcery, and sci-fi in KRULL. I also enjoyed the many magical worlds created by Jim Henson and friends, in films like LABYRINTH and THE DARK CRYSTAL. 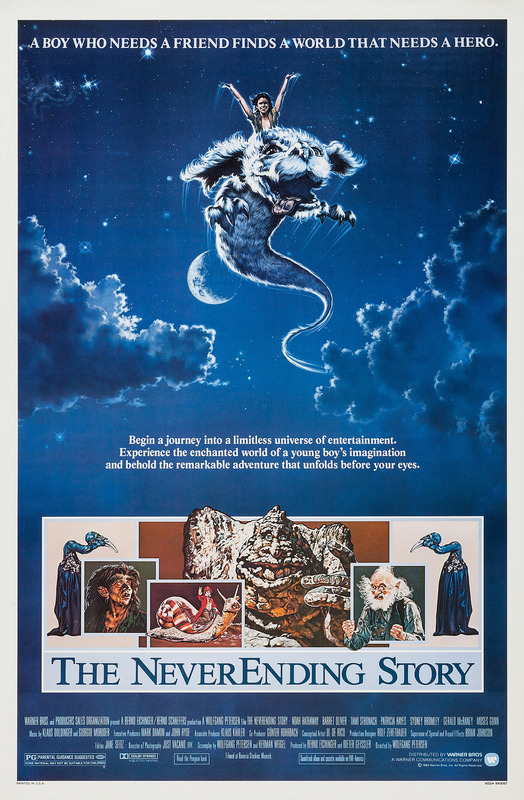 While all of these films really let my imagination run wild, one fantasy film in particular struck a chord with me, and to this day it is still one of my all-time favorites: THE NEVERENDING STORY. Based upon the novel by Michael Ende, this rather faithful adaption chronicles the near destruction of a fantastical world called Fantasia. Inhabited by all sorts of strange and wondrous beings and creatures, this magical land has come under attack by a burgeoning force called “The Nothing.” No one seems to know of a solution, so a young warrior named Atreyu (Noah Hathaway) is called upon to fight the destructive force and save Fantasia, as well as its kindly ruler, the Childlike Empress. Though he sets off on a long, and seemingly hopeless quest by himself, Atreyu is not alone. A young boy named Bastian Balthazar Bux (former child actor, Barrett Oliver) is following Atreyu’s trials and tribulations in a book called THE NEVERENDING STORY. I always imagined that ‘The NeverEnding Story’ would be a much thicker book. This must be the Reader’s Digest condensed version. Locking himself in the attic of his school, young Bastian is hiding from the real world, and for good reason. His mother has recently passed away, his father is emotionally distant, he’s chased around and tossed into dumpsters by bullies, and his imagination is frowned upon by his peers. He is “the weird kid,” an outcast, which makes it easy for him to slip into the fantasy world within the book. However, all is not as it seems. For though he thinks he is only reading a work of fiction, Bastian soon finds that he is actually playing an integral role in the actual NEVERENDING STORY. In fact, as the film reaches its seemingly apocalyptic ending, it is all up to Bastian to save the day and help restore Fantasia to its former glory. Will he succeed?! THE NEVERENDING STORY is a beautiful film in so many ways. The cinematography is gorgeous, with wide sweeping shots of deserts, oceans, and mountains seen from a luck dragon’s point of view. The matte paintings seen throughout the film, courtesy of Jim Danforth (one of cinema’s biggest unsung heroes) Caroleen Green, and Frank Ordaz, are fantastic, and blend seamlessly in with everything else. Aside from “The Swamp of Sadness,” just about everything in Fantasia is appealing to the eye. The cast of the film is quite good, with all of its child actors turning in exceptional performances. Barrett Oliver is great as Bastian, a young kid whose world is crashing down around him. Though I do tend to wonder how the authority figures in his life are reacting to his disappearance, none of that is important. What is, is that Bastian finds the courage to continue reading the book (despite the freaky fact that he’s part of the story) and help save Fantasia. For if Fantasia is completely eradicated, it could mean the end of humanity’s hopes, dreams, and wishes. It’s pretty high stakes stuff for an introverted kid that life seems to be constantly shitting on. But the point of the film is that he learns that he is not totally helpless, that he matters, and that he has the strength and courage to carry on. Also worth noting in this film are Noah Hathaway (Atreyu; Harry Potter Jr. in TROLL) and Tami Stronach (The Childlike Empress). Also, I’ve got to mention voice actor Alan Oppenheimer, best known to many of you kids from the ’80s as the voice of Skeletor from HE-MAN & THE MASTERS OF THE UNIVERSE! He pulled quadruple-duty for this film, doing the voices for Rock Biter, Falkor the luck dragon, G’Mork (the evil wolf-like creature that hunts Atreyu across Fantasia), as well as the Narrator at the end of the film. He gives so much personality to the characters he lent his voice to in this film, and helps bring them all to life. The man is a legend, and he does some of his best work in this movie. Many veterans from Industrial Light and Magic were involved in the visual effects, while an army of American and German engineers created the animatronics, puppets, and miniatures. The end result is some breathtaking visuals, and numerous characters that are still remembered decades after the film’s release. Which brings me to one of the film’s main strengths: It presents its audience with a fully realized and fleshed out world, teeming with an odd assortment of beings. There are stone giants that subsist on the very thing they are made of, racing snails (jockeyed by Deep Roy! ), people that ride giant bats, giant sneezing turtles, multi-faced humanoids, preteen Native American warriors, luck dragons, talking wolves, and more! It’s weird, and cool, and no time is wasted on explaining why any of them exist. They are just there, in this world of pure fantasy that is the culmination of humanity’s combined imagination. THE NEVERENDING STORY is definitely one of the more subtly Meta films that I’ve seen. At one point during the climax, the Childlike Empress tells Atreyu that their adventure is being followed by a young boy, who’s story is also in turn being followed by others: It’s all part of The NeverEnding Story. I think it’s a pretty cool way of including the audience, and making them feel like they are almost part of the proceedings. Of course, it got me to thinking… if Bastian is watching Fantasia, and we’re watching Bastian…. who is watching us? Nostalgia be damned, THE NEVERENDING STORY is a timeless classic in my eyes. It’s well-directed and shot, has a talented cast, great effects (that hold up better than expected), and it boasts an excellent soundtrack as well. Said soundtrack (for the American cut) is comprised of original music by composer Klaus Doldinger, as well as music written by Giorgio Moroder, who created the film’s famous theme song. THE NEVERENDING STORY is one of the greatest fantasy films of all time. While some may disagree with that statement, I stand by my opinion. Even after all these years, this movie still manages to elicit the same emotions I had when I first saw it at a very young age. (With one exception: I’m no longer terrified of G’Mork!) That is one of the highest compliments I can bestow upon it, because far too many contemporary films fail to elicit a strong emotional response at all. By the way, have you ever wondered what happened to that trio of bullies after their harrowing experience with Bastian’s pet luck dragon? The video below shines some light on this mystery. Note: This review is for the bare bones Warner Home Video Blu-ray that was released on March 2, 2010. You can order it HERE. The Packaging: THE NEVERENDING STORY comes in a standard Blu-ray case with the international (?) poster art on the cover. I believe the original U.S. poster art showed Atreyu riding Falkor (as seen HERE). The cover art utilized for this disc seems to be a photoshopped version of the poster design that was used in Italy, Spain, the U.K., and various other European countries. It almost has a Drew Struzan quality to it, though I don’t believe he did the poster for this film. Audio & Video: The disc features a nice 1080p transfer, with a 2.40:1 aspect ratio, and (for the first time ever) a DTS-HD 5.1 audio mix. The picture quality is actually very good on this disc, and easily blows the previous DVD releases out of the water. The same can be said for the 5.1 audio, which is also a large improvement over previous home video releases. The film looks and sounds surprisingly good! The Extras: Zilch. Nada. Nothing. Not even a theatrical trailer is included here.